For a long time I known about Hirst Arts and their molds. By using plaster and other substances once could cast bricks, doors, and other parts to make your own dwarven forge style props for your miniatures. Even complete buildings could be made if you wanted too. About two years ago Kelly Anne, my wife, got me an inexpensive mold kit, from the science section of a craft store, that allow me to make plaster rocks. Which was useful as props for outdoor encounters in my game. I found I liked doing it but still didn't rush out and get the Hirst Molds as they were expensive ($35 to $45 per) and wasn't sure how durable everything would be. But then out of the blue, my friend Dwayne of Gamers Closet, got several. I went over to his house to see him casting and came away very impressed. The molds are built to last being made out of a heavy silicone rubber. Definitely worth the premium one paid for them. So when Kelly Anne was looking for a gift for me this years, I asked for one of the Hirst Arts Molds. I picked #85 Cavern Accessory mold (scroll down to find) as I rarely used the Dwarven Forge props I have (other than the doors) but use the numerous furniture and item props I own a lot. They take paypal and soon I had my mold in hand. It comes dusted with powder to keep it in good condition when shipping, so per instructions I cleaned it and prepared my first cast. Got some parts out of it but many of the pieces with thin walls broke. Eventually following the excellent tutorials and instructions on the Hirst Art Site. I was able start casting good parts reliably although I still working on getting rid of all the air bubbles. My brother-in-law is a dental supply technician so I decided to bite the bullet and ordered a box of Die-Keen dental plaster from him. The stuff is like wow, mixes very thin and sets (hardens) very quickly. Plus it is twice as strong as any of the plasters found in the store. Parts still can break but very chip resistant. Air Bubble are still a problem but I am working on that. I am probably going to pick up #250 Small Brick Mold next so I can build fireplaces and other small stone miniature props. The above show some of the pieces painted. In this case the sacks of grain/stuff/etc. along with some crates and chests. The pieces up at the top has only been primed but it illustrates that you are not just limited to the obvious choices in the molds. Many of the pieces are in halves or sections so you can combine in interesting ways. Here I glued the stone doors together along with two of the small pillar halves and the lion face to make a shrine to Mitra, the lion goddess of honor and justice. If the molds have one disadvantage is that the brick molds require a lot of castings to get enough to build even the simplistic projects. Many of the most avid users of Hirst Molds get multiple molds of the same type to speed up production. While other set aside a short period of time daily to setup a casting . After a few days they have enough for their project. Last you find that you have extra parts that you don't plan on using which makes for a nice surprise gift to you fellow gamers that also use miniatures. Just got done with the first round of edits for Scourge of the Demon Wolf, send it back to Tim and also sent it to selected friends and associates for comments and suggestions. It looking like it will be in the 48 to 64 page range, closer to 64 than 48. It will be packed with stuff in the supplement. So folks should be able to get a lot of use out of the book after the adventure is completed. A conclave of magic-users ranging from 1st to 12th level, an entire village presented a level of detail similar to the village of hommlet, a mini sandbox detailing a barony and more. Labels: majestic wilderlands, News, Scourge of the Demon Wolf. A year ago Patrick Walsh sent me a combined PDF of my Sandbox Fantasy. As thanks I want to publicize his blog, BugBears for Breakfast. A catchy title. He also tells me he working on a novel so keep your eyes out for that as well. As thanks to Tim for editing Scourge I made an offer to pay for ten orders of a copy of Knowledge Illuminates or an issue of a Manor. What I didn't do is think the logistics through and this post is going to fix that. Four have spoken up leaving seven copies available. Sorry for the weird formatting hopefully it won't be scraped by spammers. Update: All Copies Spoken For I will get this setup with Tim and let you know what going on. David Macauley for The Manor *I got your email so you are all good. Mike F. for Knowledge Illuminates *I got your email so you are all good. John P for the Manor *I got your email so you are all good. David B for Knowledge Illuminates *I got your email so you are all good. John A for the Manor *I got your email so you are all good. Josh S for the Manor *I got your email so you are all good. C.T. Grew Knowledge Illuminates *I got your email so you are all good. Kerry H. For Knowledge Illuminates *I got your email so you are all good. Labels: News, Scourge of the Demon Wolf. James and I wrapped up some neglected business when we started talking about his Indiegogo campaign. He pitched the idea of me doing one of my sandbox settings as a exclusive bonus. We quickly came to an agreement. If the projects get funded I am drawing and writing my 10th? 11th? (well it getting to be a large number), sandbox hexcrawl. The subject matter is going to be a bit different than the usual medieval D&D style fantasy I been doing. Like the Arrows of Indra map I drew, this is going to be grounded in a semi-historical setting with elements of fantasy added. I will leave it to Jim to announce the details. Writing using history is a challenge as you need to meet people expectation of the time period as well add your original work. Luckily the specific area we settled on has a lot of cool things to work in for the fantasy elements and it is still at the center of the action for that time period and place. Plus the research for the map is already done as I found the perfect base map to draw off on the first try. Thomas the Innkeeper doesn’t know much of what’s going on in Kensla, but hopes that the troubles don’t reach Denison’s Crossing. He is confident that the toll guards stationed here will be able to handle any trouble. If asked about the baron’s huntsman, Sir Padrin, the Innkeeper becomes animated. He exclaims that was the best four days of business he had in a long time. Not since those mages stopped here on their way to the Golden House. The huntsman and his party eat ate and drank lavishly and then paid their bill promptly each time they left. Although the wolf skins he huntsman brought the second time stunk. Thomas will inquire after the huntsman health. If informed about the huntsman being in the stock he looks crestfallen and mutters that he hopes that it gets sorted out. I need to rewrite the section so that it is speaking in Thomas' voice. So throughout the week I will be working on this and the rest of the document. As a small part of my thanks for Tim, if you haven't bought a copy of the Manor or Knowledge Illuminates, both by Tim, take a look of at them and if you like them I would appreciate you buying a copy. As extra incentive I will pay for one copy of either to the first ten individuals who email me. Update: One of Ten claimed. Fixed it so you can email me from my profile. (hopefully) Sorry about that. 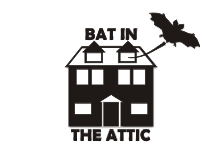 Labels: bat in the attic games, majestic wilderlands, Scourge of the Demon Wolf. A while ago Patrick Walsh sent me a formatted PDF of the articles I written for How to Make a Fantasy Sandbox. He is a great job but I lagged on posting it because I thought I would be writing the book by now. I will eventually write it but to make it easier for everybody to use the Sandbox series. I am going to make Patrick's PDF available. How to Make a Fantasy Sandbox by Robert Conley with layout by Patrick Walsh. I do plan to finish the series on the blog among other things. I stalled out on coming up on interesting details on the buildings as I was writing virtually the same thing for Scourge of the Demon Wolf. Now that I am done with that I am making a list to write up. While I could just finish up the series and publish that, I think it will be doing sandbox campaigns a disservice. All the book would do it tell you is how to make the bits and pieces you need but nothing about how to manage the campaign once is started. What I currently doing in that area is organizing my notes and distilling it down to material that is useful. Basically it in two broad areas that work in conjunction with the material in the Sandbox series. Bag of Stuff - the material the referee has in notes, write-up and most importantly in his head to create adventures on the fly. It what allows sandbox campaigns to be run with minimal prep. World in Motion - techniques to have the setting evolve so that the players feel that they are in a living breathing place with people doing their thing. Finally to wrap this up here some thoughts from a post on Google Plus and Stack Exchange. The free form nature of role-playing games are difficult to manage. It is understandable why many choose to run their campaigns as a linear series of adventures. To allow for more freedom you need to get away from the idea that a campaign is a connected series of adventures. To do this you need to develop a “Bag of Stuff.” The elements inside your “Bag of Stuff” are pulled out and combined during a session to form the adventure the players are experiencing. A campaign cease to be about prepping adventures but rather about managing and expanding what in your “Bag of Stuff”. The referee creativity becomes focused on judging the consequences of the player’s action. What goes into a “Bag of Stuff? The broad categories are Items, NPCs, and Locales. Items are the physical object found in the setting both mundane and supernatural. NPCs are the characters including generic template that can be customized on the fly with a name and personality (Barkeep, guard, etc). Locales are descriptions of sites both specific and generic. This part is the most like writing an adventure except the effort should be focused on description not plot. A Palace could be a setting for an audience with the king one session or the scene of a raid on the royal treasury the next. General locales are generally the most flexible. A typical church of the god of honor, a peasant hut, a manorhouse. The more well-read the referee is the more able they will be able to customize the generic elements into the specific items the PCs encounter. Coupled with this is a “World in Motion”. Making a living breathing setting that exists outside of the player’s actions. To prepare the “World in Motion” for play, the referee draws up a timeline of what going to happen in the setting for the expected length of the campaign. It may be a year, two years, or a decade. This timeline is written has if the characters did not exist. It will guide the referee as to what specific items, NPCs, and Locales need to be added to the “Bag of Stuff”. The “World in Motion” comes into play through the background color, news, and rumors the referee uses during play. Referee will focus a timeline on events that are of interest to himself and his players. Managing the campaign is about deciding the consequence of player actions and their effect on future events. The referee will need to be prepared for drastic alterations if circumstances required it. Above all remember that the timeline is a plan not a script. Like a plan of battle it changes once put into action. The creativity of the referee comes primarily in deciding the consequences of the player’s actions. Not just picking out the likely consequences but the one that are both probable and interesting This is because we are playing a game not writing a alternate history thesis. By adopting the “Bag of Stuff” and the “World in Motion” as tools in managing a campaign you will find that you can allow players to have considerable freedom within the setting and the amount of prep work remains the same as a campaign comprised as a series of linked adventures. If you chose to retain the setting for subsequent campaigns you will find your prep work to be considerably reduced as much of the material is recycled into the new campaign’s “Bag of Stuff”. fad for all thing Japanese that started in the early 80s, at least in my area, that I carved out a section of the Majestic Wilderland to place a culture that is an analogue of medieval Japan. There are differences for example the "emperor", known as the Imperial Prince, is viewed as the Son of Mitra rather than the Son of Amaterasu. But all the familiar 80s stereotypes are there, the weapons, the martial arts, the feudal hierarchy, the code of Bushido, etc. And geographically it wasn't even that far from Nomar so it was plausible that the character has the exotic weapons. I am currently preparing for a GURPS Campaign set in the Nomar region of the Majestic Wilderlands. It going to involve six players; two of which are new to GURPS (Dan and Rusty), two are causal players of GURPS (Brian and Josh), and the last two are very experienced in GURPS (Tim of Gothridge Manor and Dwayne of Gamers Closet). For the causal players and the novices I work on cheat sheets to help them get going with character creation. I ask them what they want to play and I give them options. One of the players may play a dwarf so I decided to update my dwarf packet. The original one can be seen here. It is basically a port of the the Fantasy Folk version of Dwarves over the Majestic Wilderlands. Well since then I wrote a supplement that finally nails down the details of the dwarves in the Majestic Wilderlands and I decided to back port that into GURPS. The result is this packet. The template is a lot shorter (and cheaper) than the Fantasy Folk version and reflects the stats I came up for Swords & Wizardry. I wasn't sure what to do with the -1 Charisma but decided on Unattractive with the caveat that it only effects other races. I probably should have lowered the points for it but since the campaign is going to be set outside of Thunderhold and other dwarven homelands it worth the full amount. You can download the packet from here. It my turn next to run a campaign for the Monday night group and we are returning to GURPS and the Majestic Wilderlands. It will set Nomar as outlined in a previous post on this blog. I will share the details and handouts in a future post. As I sat down to work on this. I stated pulling together the stat cards and templates I will be using to create the possible NPCs and creatures the players will be running into. Just I started I noticed that there was new Dungeon Fantasy release. DF 15: Henchmen. Written by Peter V. Dell'Orto of Dungeon Fantastic and Sean "Kromm" Punch, GURPS Line Editor; it gives advice and templates on constructing henchmen/hirelings to run around with GURPS Dungeon Fantasy characters. I was looking forward to this because this particular DF was spawned in part by the positive reaction to the NPC stat blocks found in the back of the DF Adventure 1, Mirror of the Fire Demon. And of course as usual for SJ Games the resulting product is far more useful than just a collection NPC stat block would have been. After a brief introduction and some commentary on the roll of henchmans and hireling it dives into the templates. They are presented in two sets, 125 point Henchman and 62 point Bargain Hirelings. The standard henchman includes ones like Agents, Archers, Brutes, Killers, Sages, etc. The Bargain Hirelings 62 point characters include cultists (for those characters with megalomania :-) ) Guards, Laborers and of course the Torch-bearer. The 2nd half is talks extensively about the use of henchmen in a DF campaign. First section is using them as allies i.e. D&D style henchmen. Next is using them as hireling with commentary on loyalty. Following is one of the sections that make this supplement shine how to use these templates as low powered delvers. DF version of first level. Then another excellent section about making custom delvers. Basically in GURPS you have templates which are a menu that distill the myriad character options into a simple menu so that you can build a specific archetype for your character. There is no rule saying that you have to remain in the template but rather it is an aid to quickly make new characters. In addition to template there are lens which modify a template to add abilities or complex options that cut across various archetypes. In the Custom Delver section Peter and Sean detail a dozen or so lens that when combined with one of the standard or bargain henchmen makes a character equal in power to one of the DF Hero templates. For example taking the Standard Initiate plus the Priest custom lens will create a character equivalent to a Hero Druid. Add a Veteran Lens to a Standard Squire will create a Hero Knight. 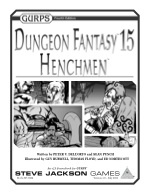 This transform the Henchmen book from a limited focus on NPCs to one that is useful for both GURPS Dungeon Fantasy and GURPS Fantasy. There is support for referees quickly making NPCs that ran from 62 point to 250 points (With DF 1 Adventurers). You could add one of the lens to a 250 pt hero template to create a 375 point character. I put this to immediate use in the handouts I am creating for help the players make characters for my upcoming campaign. At $8 it is a great deal for GURPS Referees and at 43 page can be easily printed as booklet. It also reads well on my iPad tablet. The Riftwar Saga and the Empire Series by R. Feist. I reread them two years ago and forgotten how many of the early elements of my Majestic Wilderlands was inspired by the two series. Of course Tolkien particularly the Similarion which inspired my worldbuilding. The Conan Pastiches and reading Howard notes on the Hyborian Age. This in particular is still inspiring to me. Know, O prince, that between the years when the oceans drank Atlantis and the gleaming cities, and the years of the rise of the Sons of Aryas, there was an Age undreamed of, when shining kingdoms lay spread across the world like blue mantles beneath the stars - Nemedia, Ophir, Brythunia, Hyperborea, Zamora with its dark-haired women and towers of spider-haunted mystery, Zingara with its chivalry, Koth that bordered on the pastoral lands of Shem, Stygia with its shadow-guarded tombs, Hyrkania whose riders wore steel and silk and gold. But the proudest kingdom of the world was Aquilonia, reigning supreme in the dreaming west. Like how could you not want to ramble around in a setting that like? 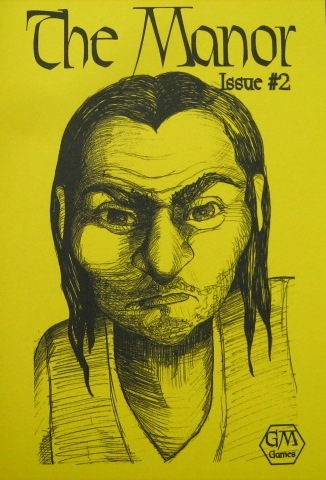 Harn by N. Robin Crosby. While not novel fiction the whole package has been a continuing source of inspiration for my own games. Later was A Song of Ice and Fire i.e. Game of Thrones by G.R.R. Martin for similar reasons that Tim of Gothridge manor gives. How politics and the clash of cultures drives much of the action. This started out when I read the description of the 8th level Permanency spell in Swords & Wizardry. I saw that unlike AD&D it has nothing to do with magic item creation. It does what the spell title suggestions, makes a duration of a spell permanent. I then went to the Greyhawk Supplement to see how the original was worded, pretty much the same. Then I thought to check out Enchant Item as that is a 6th level Swords & Wizardry spell. And it wasn't there nor in Men & Magic or any of the supplements. I asked around the forums, Google plus and StackExchange and with the aid of helpful posters found that it not in any of the Dragons or Strategic Reviews. Wizards and above may manufacture for their own use (or for sale) such items as potions, scrolls, and just about anything else magical. Looking at the level chart on page 16 of Volume I we see that the title "Wizard" refers to a 11th level magic user. There it was made into a 6th level spell which can be cast by a 12th level wizard. In addition the 8th level permanency spell has been altered to make it a requirement for the creation of permanent magic items. This meant that in AD&D, compared to OD&D, the level of making permanent magic items has been increased from 11th level to 16th level. Wow Gygax must not have liked 11th level character making magic items. Tim of Gothridge Manor describes some of the editing process for my upcoming adventure/supplement Scourge of the Demon Wolf. Already have a few items to take care of; revising a map to make the number key more easily readable, writing a brief summary of the encounters of the adventure so that the referee can get an overview of the action, and writing up some brief background notes so that referee can roleplay the cultural conflicts better. Wolf Pack Leaders, AC 6, HD 3+2; HP 15; ATK 1; HTB +3; DMG 1d6 (bite); MV 180’; Save: 15; Harvest: Pelt 10d. The only addition I made to the base Swords & Wizardry stats are abilities from Majestic Wilderlands. They can be ignored if the referee doesn't use them. Money is generally given in silver denoted by the d symbol. 50d is 50 silver pieces. The d symbol comes from the english notation for a silver penny and it stands for denarius the roman silver coin. In the supplement half of the book I have some more detailed descriptions for some of the magic users. The supplement fleshes out the locales briefly described in the adventure and written so that the referee will find the product useful after completing the adventure. I give more details for the magic users figuring even if the Golden House locale is not used it would be handy to have a fully described magic-user similar to some of the NPCs described in TSR's Rogue Gallery supplement. Posses: +3 Staff (1d6) with Wizard’s Touch with Teleport Charm, +2 Dagger (1d4) with Return to Hand, +2 Ring of Protection Ring of Spell Storing 3rd x 1, 1st x 2 (Lightning Bolt, Magic Missile x2), Medallion of ESP 30ft, Cloak of Protection +1, 250d. There are few Majestic Items specific item like Ritual components and Viz that can be ignored if the referee doesn't want to use them. Labels: Legacy DnD, News, Scourge of the Demon Wolf. The Manor #2 is out! Where Tim talks about how he finally found the one true desktop publishing software. A interesting potion shop with a map drawn by myself. Includes a random customer table to spice things up along with adventure hooks. A inn serving an illicit clientèle made secure by being build into the side of a cavern reachable only by water across Ten Killer Lake. Includes details about the lake itself and the inn. Finally winds up with another excellent random table by Jason Sholtis. Like Manor #1 it focuses on locales that you can easily drop into your campaign. The other day, Kelly Anne and I went out for a country drive. Along the way we had a very odd random encounter. I finally got done writing the Scourge of the Demon Wolf and shipped it off to be edited. While that happening I will be working on the stand alone version of the Wild North. Mainly altering the southern edge to fit with Blackmarsh and creating a bunch of mini-maps for towns and other locales.